It’s time to celebrate. We finally completed our butler’s pantry. It took us a bit longer than we anticipated because life happened. But we are thrilled with the results. Roughly ten months ago we stood in our third car tandem garage and suddenly had an epiphany. 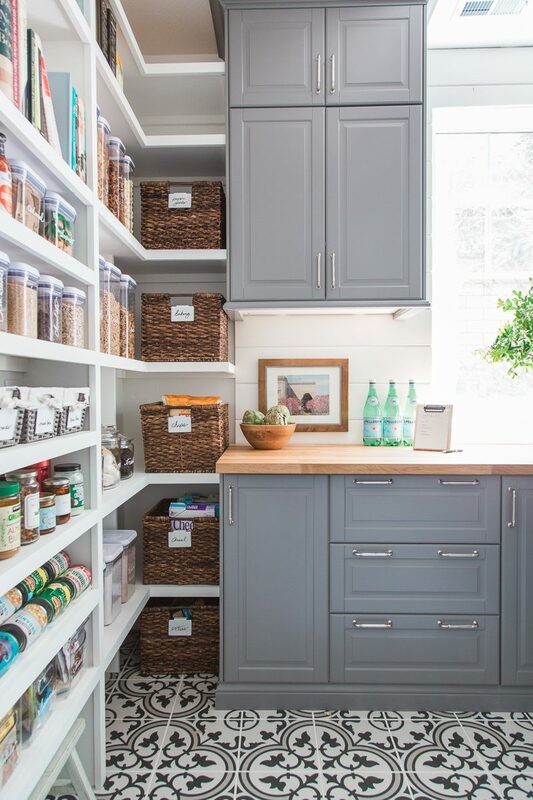 Space that was poorly used could be turned into the pantry of our dreams. Designing this space was such a joy. I loved every minute of the process and am so proud of my husband for making this all happen. I hope you enjoy a look around our pantry. Welcome. This really is one of my favorite spots in our home. It receives such beautiful morning light and I now have a place for all of the things we use when we entertain. It is just a couple of steps away from our kitchen. 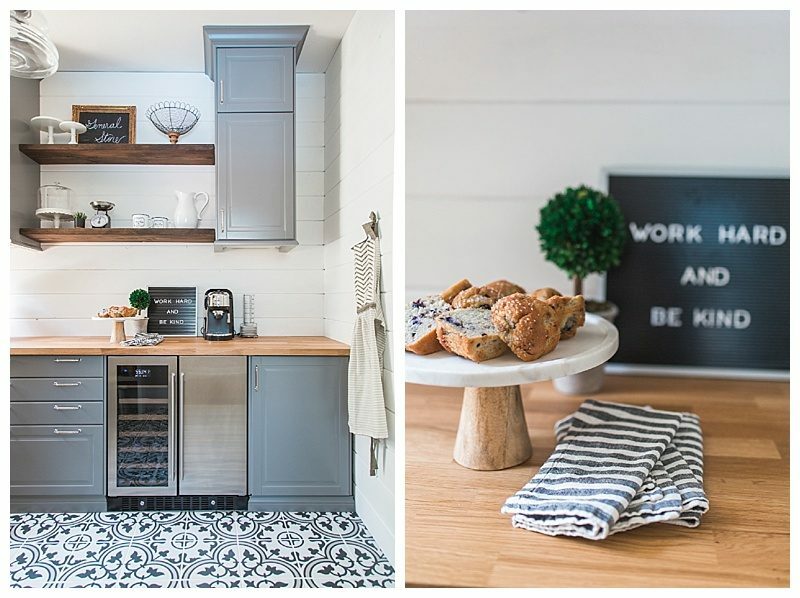 I’ve shown you what the space looked like before as well as how we did the shiplap so today is more about sharing the after photos and sources. The space was a bit of a puzzle to design because of the window. The placement created some design challenges but I think we maximized storage while still keeping the room balanced. The gray cabinets are from Ikea and we have been thrilled with them so far. There are so many great options to choose from. The lazy susan in the corner is ideal for storing all of my vases in one place. I designed the layout of the shelves and my husband made it all come to life. We took our time thinking through this portion of the project. I found those baskets first and designed those shelves to accommodate them. My dad used to come over and check out our progress. He would have been so excited to see the finished space. In fact, I used so many of his containers from his own pantry. He had recently organized into a dream space and so I love that I have a bit of his cleverness and organization in this room. Any of the food items we don’t want on these shelves is in the cabinets and drawers you see above. 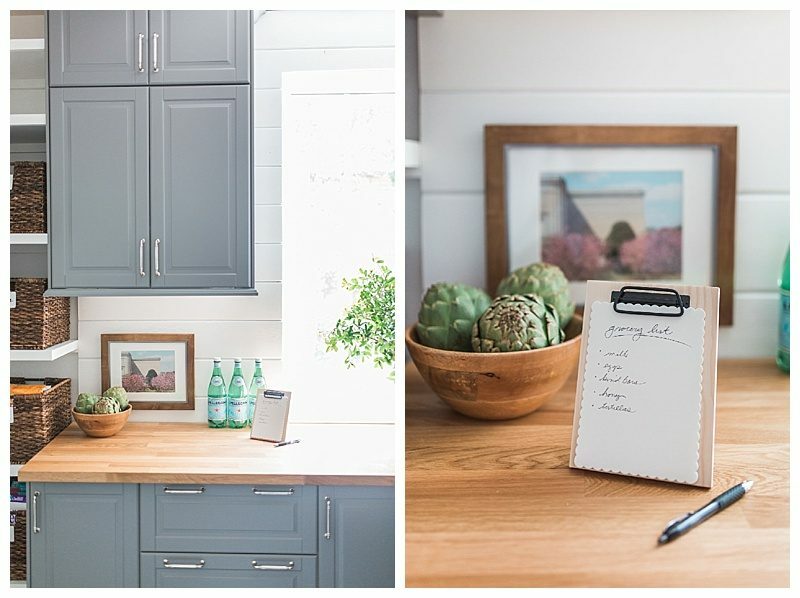 This little clipboard sits on the counter and when we are out of something, we immediately write it down. Makes grocery shopping so much easier. A couple of these cookbooks belonged to my mom. They still have her post it notes sticking out of them. 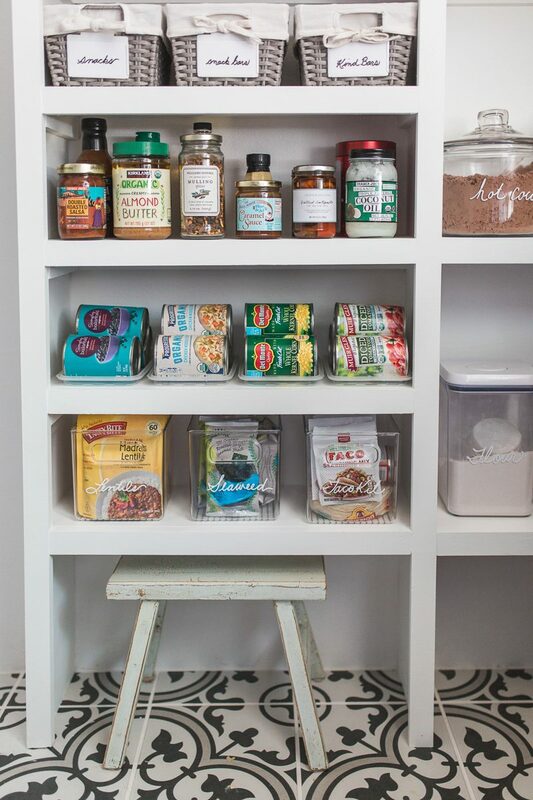 Before we ever built these shelves, we gathered everything we wanted to be stored and figured out the best containers for our family. This helped us plan out the dimensions for this space. The jar of Oreos (not usually a staple around here) is a tribute to my family. Growing up, every night after dinner, my brother would get up and grab the blue Oreo tin from our pantry and pass it around. It was our little sugar fix after we ate. To this day I can imagine my dad reaching his hand into the jar and pulling one out. So here’s to family and to making memories. One sweet treat at a time. The white label clips are currently on sale (linked below). I used a dry erase marker on those and a white paint pen on the jars (water based). The canned food we have out on these shelves is what we use on a weekly basis. The cabinet to the right of the baskets has the rest of our canned food. The gray baskets are my favorite. Each child has a basket with their favorite snack (we switch it up each week or so) as well as one for my protein bars. It’s so easy for them to grab something if we are headed out the door or off to a practice. It’s their job to write it down on the grocery list if they are running low. Whatever doesn’t fit in these baskets goes in the “extra” bin which is the brown basket on the floor. That has worked really well. We only have a s’mores container during summertime. It’s fun when we have friends over to head out to the fireplace in the back yard and roast marshmallows. I will switch it up during the holidays. This little stool was a HomeGoods find and is perfect for reaching the top shelf. We made sure this first shelf was elevated enough so that the stool could be tucked away. The canned food holders are another clever discovery by my dad. They are actually the lids from take-out containers from the restaurant they used to go to daily. 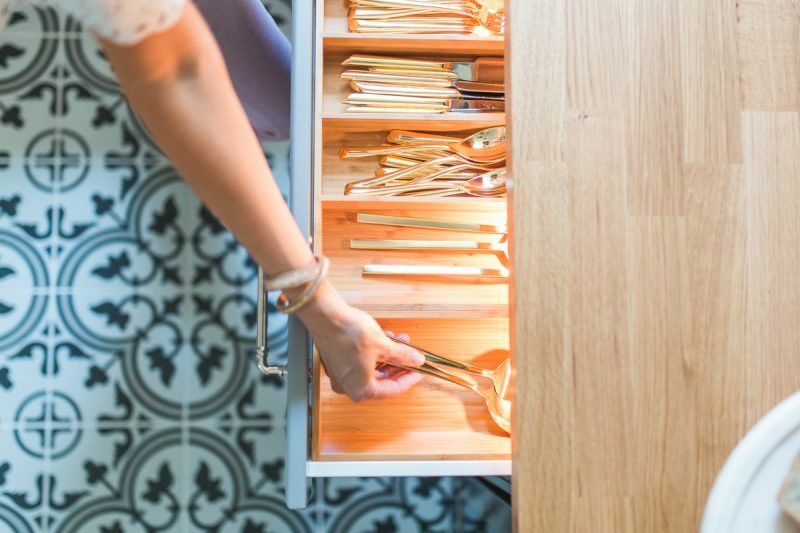 The most exciting part of the Ikea cabinetry are the drawers that light up! Do you know how many times I have walked in here at night just to open the drawers! They look so cool. It’s the little things, right? The wine and beverage center has been fantastic. 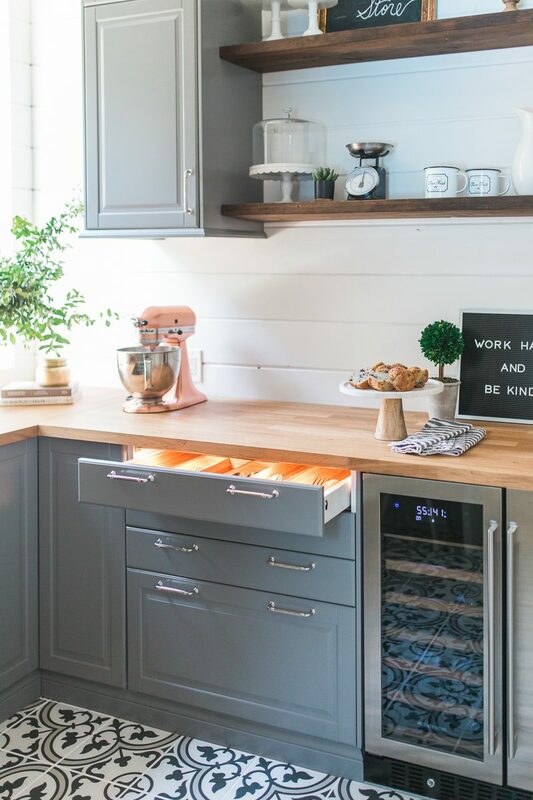 One side holds wine while the other is great for sodas, waters, and beers when we entertain. It’s nice to have it all in one spot and then let guests help themselves. I hope you enjoyed the tour. To be honest we had so much fun working on this space and I can’t wait to tackle another room with my partner in crime. Hi Courtney. The space looks great! 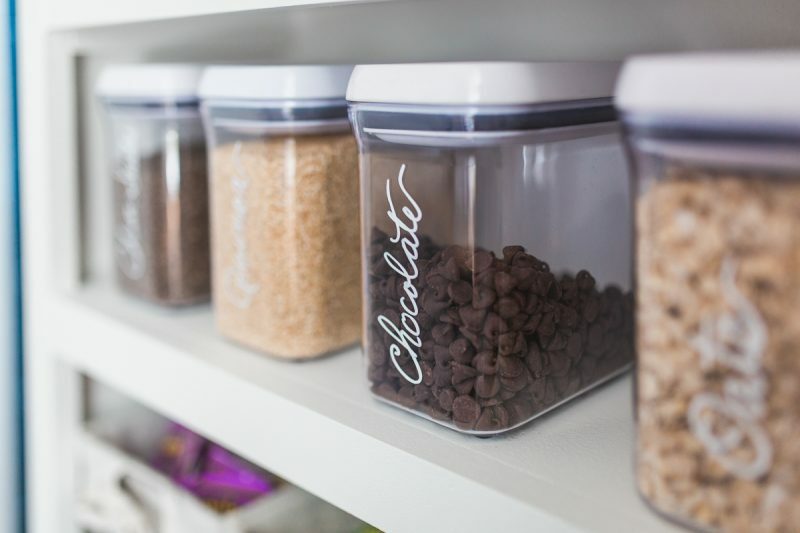 What did you use for the white lettering on the glass and plastic containers? Is it just a chalkboard marker? Thank you, Hollie. I used a white sharpie paint pen. But it is water based so it can be washed away. Wow, a dream come true. It is fabulous Courtney. Truly a labor of love. This is my DREAM space!! You and your husband did such a fantastic job! 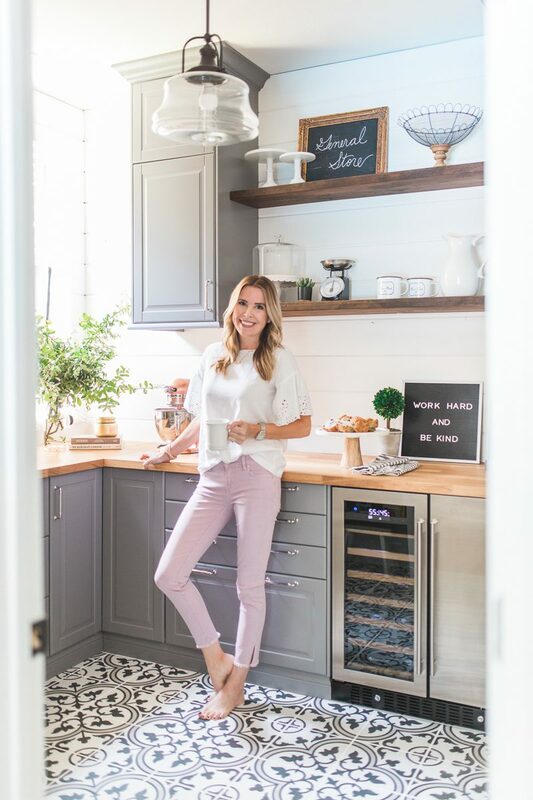 Going home to reorganize my pantry today for sure 🙂 I love that you were able to incorporate some items from both of your parents. Any space that can be personalized is that much more special. You are inspiring me to think outside the box more, I love your ambition to see an unused space and turn it into something amazing!! I want to be jealous of this beautiful and well thought out space, but you are just too sweet. 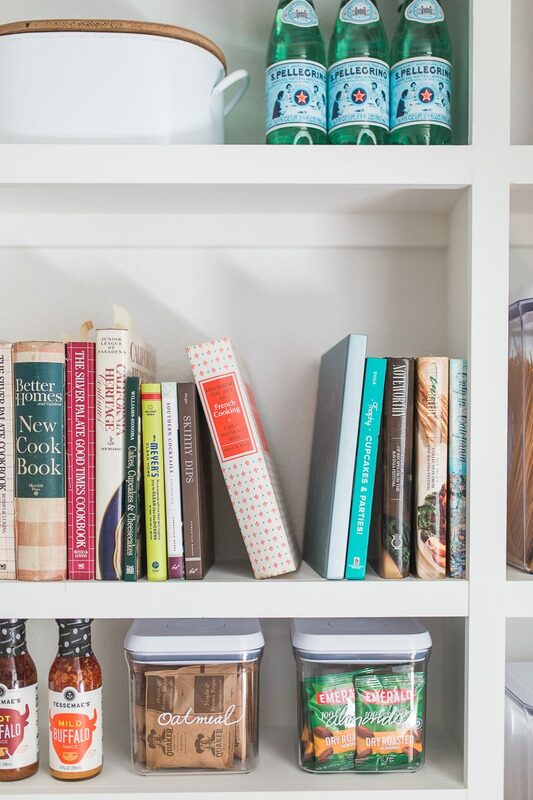 I love hearing about the personal touches–and how your mom’s cookbooks and your dad’s smart ideas will keep your families memories alive. Just lovely. Agree with this! 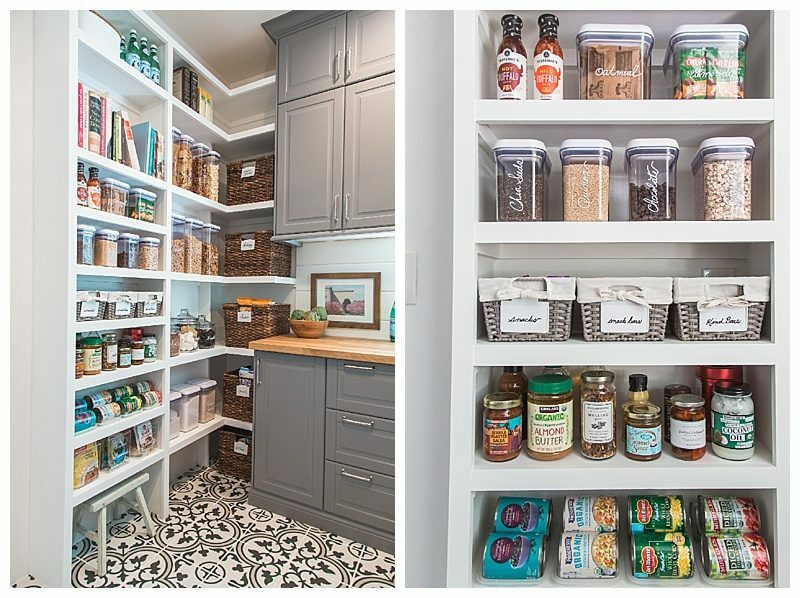 That pantry is bigger than my kitchen. But so well done.great that you did all the thinking before choosing the final dimensions. Also, those light up drawers are so cool! I would totally move a mattress in there so I could wake up in the middle of the night to make them glow ???? It’s beautiful! 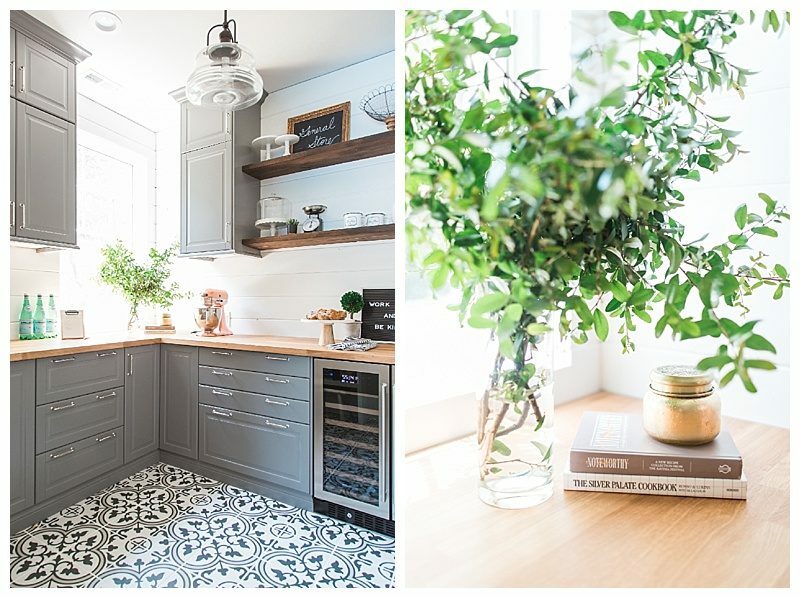 Can you tell me how/what products you use to clean that tile floor? We moved into a home with those recently and I can’t get them to look clean! LOVE this space. You maximized every inch and made it all look so pretty. The tile (!) 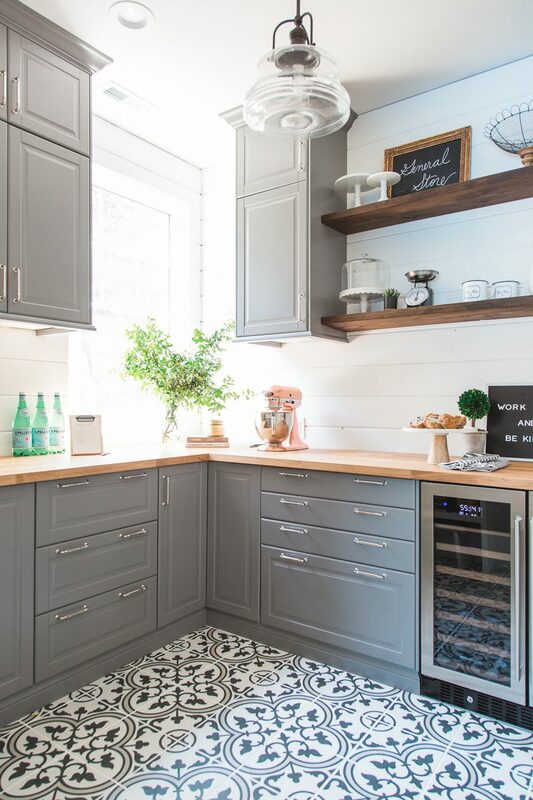 is amazing, and I love the gray cabinets with the white shelving + the wood for warmth. 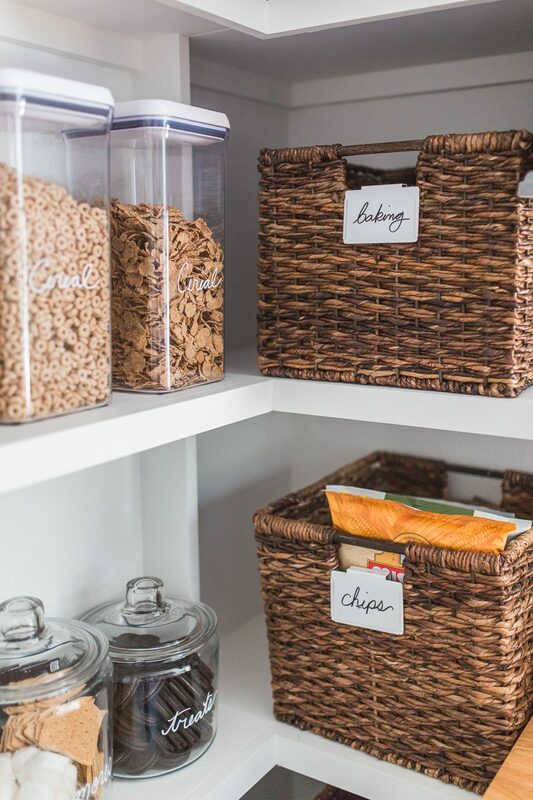 I need to take a page out of your book and push my kids to be more responsible for writing down what is getting low in the cupboards… and to make these useful spaces more beautiful. Well done! Love it, looks so well planned out and pretty! We are working on a pantry redo as well. Can you tell me what type of plywood you used for the shelves (Birch, pine etc) and what color stain? We are doing some testing, but can’t quite get the look we want. It is soooo good! Congratulations! Where did you find your little clipboard? Absolutely beautiful! I love the family touches and traditions you incorporated and how much thought you put in to each decision. What kind of wood did you use for counters? My son is remodelling a house and wondering about the durability of wood counters. Any info would be great! 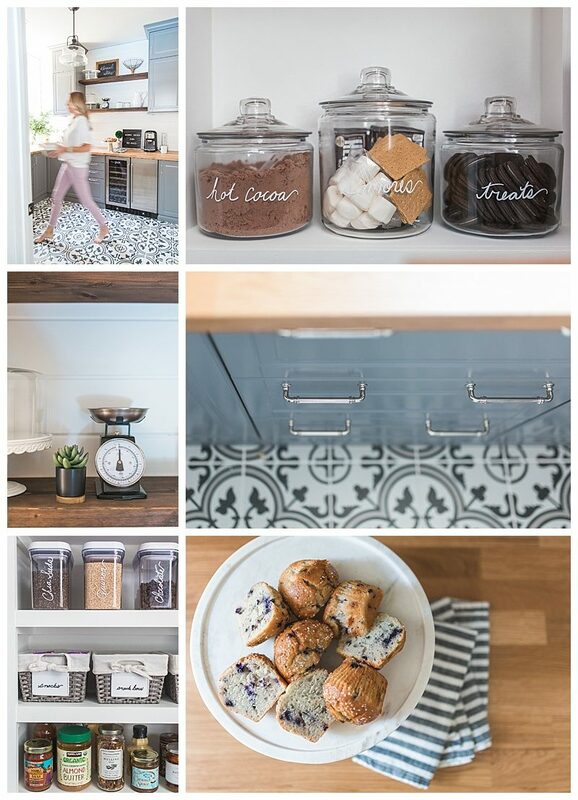 I absolutely love everything about this pantry, such an inspiration for my own home! Thanks for sharing!